After introducing her friend to The Church of Jesus Christ of Latter-day Saints, a young woman now serving a mission in Japan was surprised to learn her friend would be serving a mission in the same country. Brooke Lacey and Jason Sherrill met during their senior year of high school in Apple Valley, California, after Sherrill moved from Kansas. They quickly became best friends, and Lacey invited Sherrill to LDS activities for youths. Sherrill’s interest in the church grew after spending a lot of time with Lacey’s family in their home. He watched as the Lacey family would read scriptures, hold family home evening and pray together.Sherrill was baptized just after his 18th birthday. 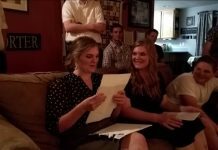 Shortly after that, Lacey received her call to serve in the Japan Tokyo Mission. She left in January 2015, and Sherrill submitted his own mission papers in June 2015. 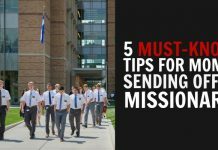 When he received a big white envelope a few weeks later, Sherrill was surprised to find out where he had been called to serve: the Japan Fukuoka Mission. 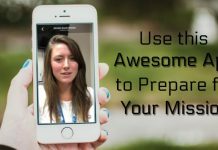 When Sherrill opened his call in July, Lacey’s family recorded the event and sent it to her—making sure not to mention where Sherrill would be serving. The YouTube video, posted above, shows the reactions of both Lacey and Sherrill when they found out they would be serving in the same country. Sherrill will enter the Missionary Training Center in Provo this October. Read more about Sherrill’s journey at DeseretNews.com.